If you were walking down the street and someone handed you a completely colorless Rubik's cube and asked if you wanted to have a go, chances are you'd hand it back with a quick, "nahhhh, I'm cool." And you would just keep on walking. BUT! What if you looked up and saw the device was actually controlling an entire, rainbow-hued building all lit up and shining right in front of you? 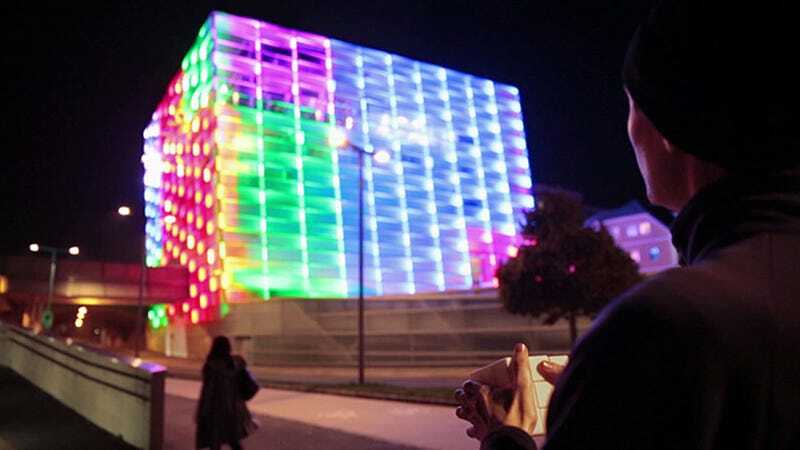 Javier Lloret's Puzzle Facade allowed people on the street to "solve" the Ars Electronica Center in Linz, Austria. Housed within the white 3D printed case were a series of electronic components—including Arduino and a bluetooth modem—that connected to a computer running his special software, all of which controlled the large-scale lights. How neat would it be if you had the opportunity to operate the lights on the Empire State Building for even a minute, or to choreograph the twinkling on San Francisco's Bay Bridge? To see something that massive respond instantly to your touch from afar—through a 3D-printed Rubik's cube, of all things—would be incredible.